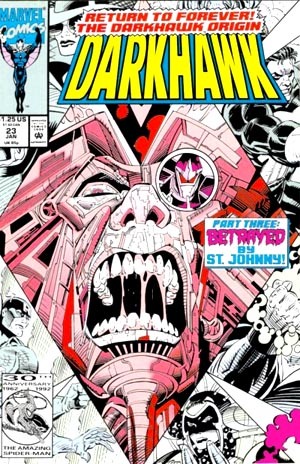 Other Names: Saint Johnny; Srev; "the former Darkhawk"
Saint Johnny is the key figure in Darkhawk's origin. The alien (who possessed the body of homeless vagrant John Trane) led Chris Powell to obtain the amulet that transformed him into a super-hero. At times, Saint Johnny served as a mentor and guide to Powell in learning about his Darkhawk powers. Although the character was not portrayed as unusually religious as far as alien characters go, it is interesting that he was known by an overtly religious name: "Saint Johnny." Was this simply the name that the alien's human host body was known by? Or was this a name that the alien chose to be know by? Saint Johnny's human side often seems present and prominent. The character is not purely the alien in human form, but is also the original human vagrant. It is likely that John Trane's pre-existing religious background and beliefs probably came into play in the choice of the name he is known by. It is likely that John Trane's background is Catholic, hence the "Saint" appellation chosen through a fog of mental instability and/or alien possession. Alien mentor characters often have somewhat inscrutable religious, quasi-religious and/or philosophical motivations for journeying to Earth and imbuing humans with power to become heroes. Saint Johnny seems to be archetypal in this regard, but further examination of his appearances would be necessary to completely document his motivations, beliefs, etc. Darkhawk #1 (Mar. 1991): "Dawn of the Darkhawk"
Darkhawk #11 (Jan. 1992): "Heart of Stone"
Darkhawk #12 (Feb. 1992): "Masks"
Darkhawk #13 (Mar. 1992): "Journey"
Darkhawk #16 (June 1992): "Brave New World"
Darkhawk #17 (July 1992): "Hostages"
Darkhawk #20 (Oct. 1992): "Portals of Power: Sleepwalker's Rage"
Darkhawk #22 (Dec. 1992): "Return to Forever, Part Two: Flaming Terror"
Darkhawk #23 (Jan. 1993): "Betrayal!" Darkhawk #25 (Mar. 1993): "Return to Forever, Part Five: Death and Life"
Darkhawk #36 (Feb. 1994): "Seek & Hide"
Darkhawk #37 (Mar. 1994): "The Greater Evil!" Darkhawk #38 (Apr. 1994): "Call to Glory"
Darkhawk #39 (May 1994): "Space Screams"
Darkhawk #40 (June 1994): "Amulet Quest, Part Three: Death Deal"
Darkhawk #41 (July 1994): "Double Treachery"